Windows 10’s new Windows Hello technology lets you skip bothersome passwords and log in securely in less than a second. By attaching either a compatible camera or a fingerprint reader to your computer, you can log in with the swipe of a finger or a glance at the camera. Some new laptops and PCs include built-in Windows Hello compatible readers and cameras; if yours doesn’t, you can buy one that plugs into your computer’s USB port. Click the Start button, click the Settings icon, and choose Accounts. The Settings app’s Accounts page appears. Click Sign-In Options from the left pane. The screen shows your options for signing into your account, shown here. If you don’t see an option to set up Windows Hello, make sure your compatible fingerprint reader or camera is plugged into your computer and fully installed. 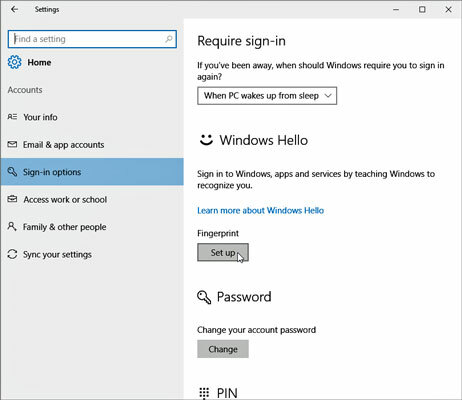 Choose an option from Windows Hello to sign in without a password. Click the Set Up button for either the fingerprint reader, or camera, and follow the instructions. Windows walks you through scanning either your fingerprint (any finger will do, as long as you use that finger consistently when you want to sign in to your account), iris, or face. You may need to create a PIN, a four-digit number that adds an additional layer of security for special circumstances. Fingerprint readers are fairly inexpensive and easy to install. I bought mine on Amazon for $15, and it works amazingly well. Many new laptops come with fingerprint readers already installed near the keyboard area. Some tablets, too, include fingerprint readers built-into their clip-on keyboards. Windows 10 recognizes most compatible fingerprint readers as soon as they’re plugged into your computer’s USB port. You rarely need to install any bundled software. Whenever you face a Windows 10 sign-in screen, just slide your finger across the reader. The screen quickly clears, and you’re ready for work. You don’t need to remember or type in a complicated password. There’s nothing to forget. Windows Hello not only lets you sign into your device, but buy things in the Windows Store, all without typing in a password. As the Windows Hello technology grows, Windows Hello may eventually let you enter your favorite password-protected websites, as well.